Around 33 lakh employees of the central government had reason to cheer on Tuesday with the government announcing their annual bonus that has been pending for two years. The Bonus Amendment Act will be implemented strictly, Jaitley said at the press conference on charter of demands of Central Trade Unions. The conference was also attended by Labour Minister Bandaru Dattatreya and Power Minister Piyush Goyal. As a measure to dissuade trade unions from going on strike on September 2, the government has also decided to raise the daily minimum wage for unskilled non-agricultural workers for ‘C’ category areas to Rs 350 from the earlier Rs 112. 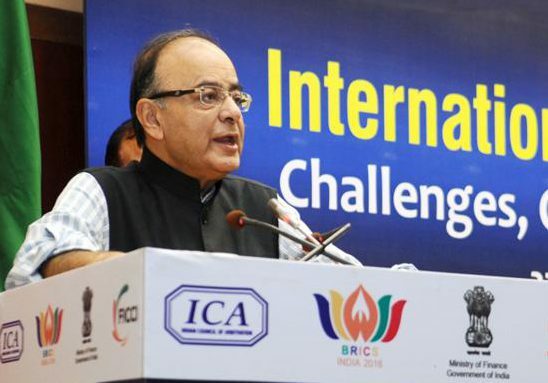 Further, Jaitley said the government will write to all states regarding compliance of contract workers law. The registration of the contract workers and their staffing agencies is mandatory as per law and states will be advised to strictly implement the same. The issue of giving social security benefit to the unorganised sector (e.g., Anganwadi, Mid-day meal, Asha, Volunteers etc.) will be examined by a committee which will give its report at the earliest, Jaitley said. Advisories will be issued to all the state governments to ensure that registration of trade unions takes place within 45 days. “We have had meeting with trade unions individually and collectively. We have had discussions with trade unions. We have had meeting with all trade unions,” Jaitley told reporters. Jaitley also allayed fears of the public sector bank employees who are opposing the merger of State Bank of India with associate banks, saying that the merger will not affect the service conditions of bank workers. A spokesperson for the BJP-affliated trade union Bharatiya Mazdoor Sangh (BMS) told IANS that they have called off the September 2 strike as the government has conceded a number of their demands in the charter. BMS, in a statement separately, also directed all its affiliate unions, members and well wishers not to participate in any strike on September 2. “BMS strongly feels that the outcome of the talks was the most fruitful and great achievement for Indian workers in the recent past. The BMS expresses its sincere thanks to the Government of India for taking right decisions,” the trade union said.